• The Versastudio BN 20 desktop printer / cutter automatically prints and cuts in one flow, removing the need to reload and reposition graphics. 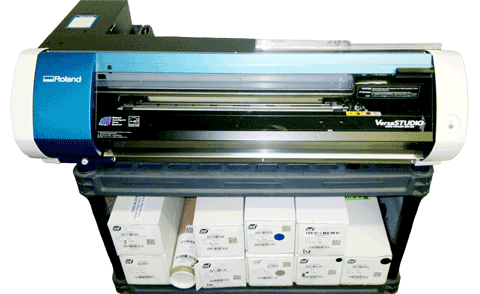 • Four point optical registration lets you remove prints, laminate, reload them for precision cutting of laminated graphics. • Exacting print ability, using advanced print head technology and up to 4 different types of ink, give users stunning graphics on apparel, labels, stickers, decals, signs and more. • Excellent for small run high margin work. • The Versastudio BN 20 desktop printer/cutter automatically prints and cuts in one flow, removing the need to reload and reposition graphics.